window_manager.invoke_popup() ignores preferences.view.ui_scale (window_manager.invoke_props_dialog() respects it). In other words, the size of dialogs created with window_manager.invoke_popup() doesn't scale with the rest of the UI. and run the script. Then change use_popup in the script to True and run again. The size of the displayed dialogs (apart from the extra "OK" button) at a given UI scale should be the same, but it isn't. @dima glib (dairin0d), could you add one or two screenshots please? I see an issue where the checkbox suddenly gets larger when I click it, but I'm not sure if we are talking about the same thing. In the attached illustration, the width of the invoke_popup() and invoke_props_dialog() is the same at ui_scale = 1.0 ("Resolution Scale" in user preferences). 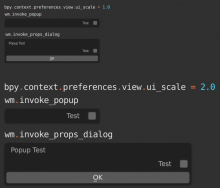 However, when ui_scale is not 1.0, the invoke_props_dialog() scales accordingly while invoke_popup() does not. E.g. at ui_scale = 2.0 the dialog created by invoke_popup() is half the size of the invoke_props_dialog(). Jacques Lucke (JacquesLucke) added a commit: rB20f78dc12f9c: Fix T61430: invoke_popup() does not respect ui scale.